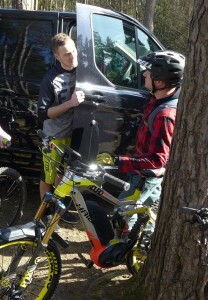 EMTB Coaching travelled down to Swinley Forest to meet up with Martin from E-Bikeshop on their April Owners Club Ride. Our journey started early so we could get there with enough time to find a space, drink a coffee and meet up with Martin and his customers. Travelling down to Swinley is an easy drive for anyone in the Midlands being very straight forward to find as its not far off main roads, unlike going to most Welsh trail spots. Martin and his customers were very friendly from the off, all enthusiastic like minded people of all ages and abilities. 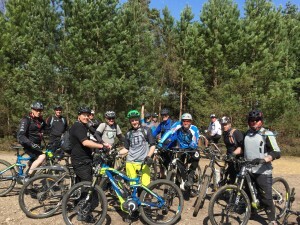 After a lovely introduction about EMTB Coaching being apart of their social gathering within the de-brief and register from Martin we all set off towards the trails. Program for the day – ride – smile – enjoy! Trails at Swinley are great, leaving the car park you head out onto a BLUE which splits onto the RED half way round for a figure of 8 ride before being back at the car. Trails are well graded with the blue having a few ‘red like’ features making people with little ability stop and think before joining the RED route. The RED has good flow to it, twists and berms most the way around giving those core muscles a work out. With a few particular sections around the RED getting your wheels off the floor “IF” you want too. Trails are heavily tree covered with pine needles on a sandy floor gives this trail a very exciting surface if you wish to scrub around corners or drifting around berms. The group consisted of 14 riders in total a very good turn out for a short planned event. It was great to participate in such a group size that made normal mountain bikers a little more aware to the eBikes, gaining custom for Martin with their curiosity. The day had eBikers together with good weather ~ big smiles ~ but most importantly great people. 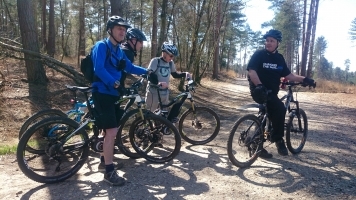 We want to thank Martin from the E-Bikeshop for inviting EMTB Coaching down to their Owners Club ride at Swinley Forest. Does an eBike make you fit?